Sony a7 and Fuji XT1 are available at almost similar prices. A lot of people have met difficulties in choosing between these two models because they are both seemed to be high-value products for a budget a little above one thousand bucks. Sony a7 has an extreme fame on the market due to the superior specifications and features that it provides. 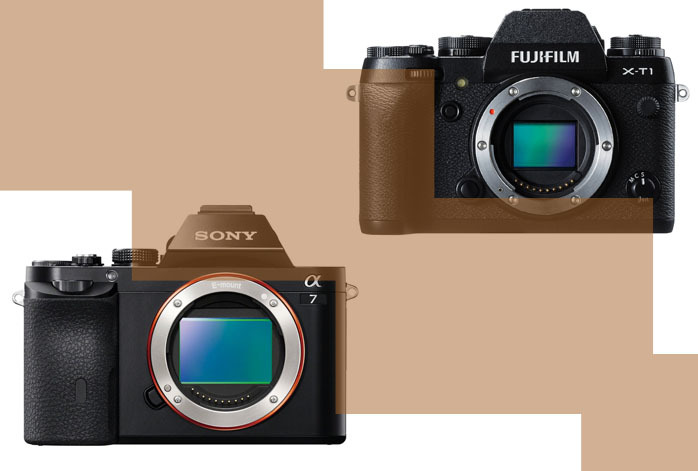 We also have compared Sony a7 to some of its variants, Sony a7S and Sony a7R, so don’t forget to check the articles. On the other hand, Fuji XT1 has the edges of being faster and more intuitive. Which one should you choose? Sony a7 is better than Fuji XT1 in terms of resolution, contrast, and sharpness. Sony a7 boasts a 24.3MP full-frame CMOS sensor with an ISO range of 100 – 25600. Sony a7 is able to capture very sharp and detailed images. The colors are also satisfyingly solid and with a decent depth. In general, it can deliver very realistic and eye-pleasing pictures. It can also record Full HD 1080p videos at an extremely smooth 60fps frame rate. It also features a 3“ tiltable LCD screen so that you can have flexible shooting positions. To make it even better, it has an electronic viewfinder as well. Unfortunately, its shooting speed is not as astonishing with only a 4fps burst. Hmm, still in Sony a7, would you consider Sony a7 vs GH4? If you prefer to have handier controls and a higher shooting speed, Fuji XT1 is the way. It only features a 16.MP APS-C X-Trans II CMOS sensor, so its details may not be as good as Sony a7. Besides, it records Full HD 1080p videos only at 30fps. However, Fuji XT1 boasts a continuous shooting speed of 8fps, twice of Sony a7’s. For sure, it has an edge for capturing fast-moving objects. Besides that, Fuji XT1 also comes with direct controls, with buttons and wheels, instead of menu settings. Some people prefer the direct controls because they are much easier and quicker to access. You should only choose Fuji XT1 is you really prefer the direct controls or the higher shooting speed. Otherwise, pick Sony a7 for the best performance and versatility.